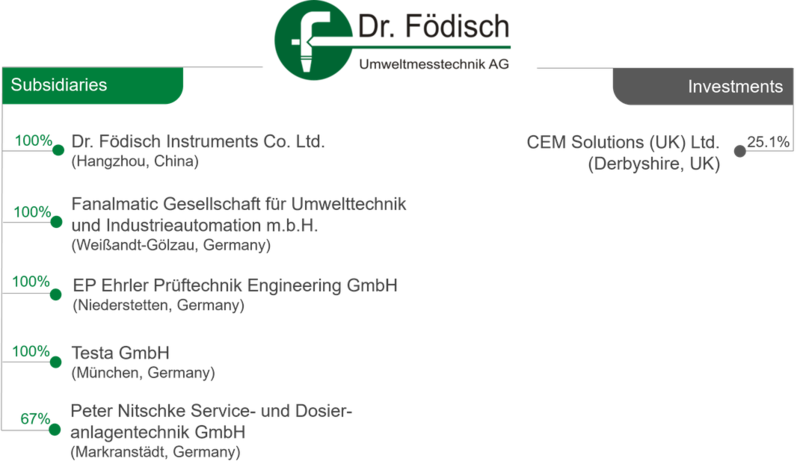 The Dr. Födisch Umweltmesstechnik AG acts as parent company together with our subsidiaries, affiliates and investments within a strong network – the Dr. Födisch Group. The concern was founded in the year 2000 when shares at Fanalmatic GmbH and Peter Nitschke GmbH had been acquired and expanded successively. The evolving cooperation and close integration offers us the possibility to develop own project ideas as well as to realise strategies for internationalization cross-industry-wise. We regard ourselves as stimulator for environmental solutions especially in the field of air and water as well as in the automation technology sector. We implement pioneering projects e.g. in the Chinese market. Thereby we act in anticipatory way and respond individually on requirements of markets and customers. Despite all entrepreneurship we keep an eye on the most important issue: the environment. EP Ehrler Prüftechnik Engineering GmbH (incl. its subsidiary EP Instruments Messtechnik + Kalibrierung GmbH) is nationwide leading soluitions provider for flow, pressure and leakage tests as well as gas measuring technology. The company offers numerous methods for treatment of tap water, waste water, process water and bath water not only for new plants but also for reconstruction and optimization of existing facilities. The system integrator in the field of automation and communication plants offers today system solutions for tomorrow considering consequently customers’ demands. The core competences automation, switchgear construction as well as information technology are united under one roof.